VW India finally makes a return to the SUV space with a product we've been wanting since 2007. 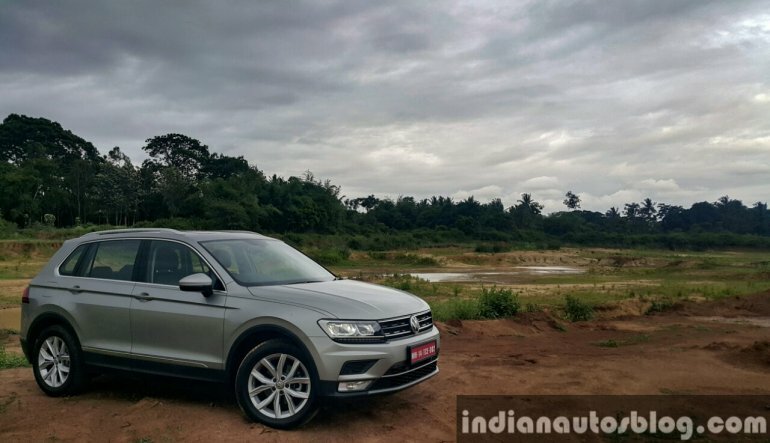 It's taken around 10 years for Volkswagen to bring the Tiguan to India, but it's finally here in its second gen avatar. While the Tiguan in other markets is pitched as a premium compact SUV to lure folks from Korean or Japanese counterparts, the Indian version targets customers of entry-level crossovers from luxury brands like Mercedes-Benz, BMW and Audi, as well as knocks on doors of full-size ladder frame SUVs like the Ford Endeavour, Toyota Fortuner and Isuzu MU-X. It's a bold move by Volkswagen, given how brand/image conscious people are in the Indian market, especially when being asked to part over INR 35 Lakhs (on-road) for a car. 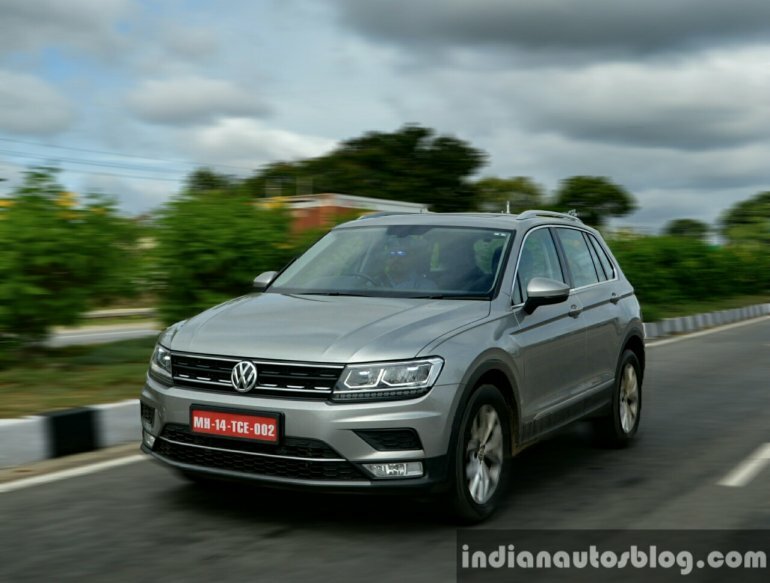 It is also VW's sole SUV since they discontinued the excellent-yet-pricey Touareg in 2014, so it raised many eyebrows as well as questions from potential car buyers during the national media drive between Bengaluru and Chikmangalur. 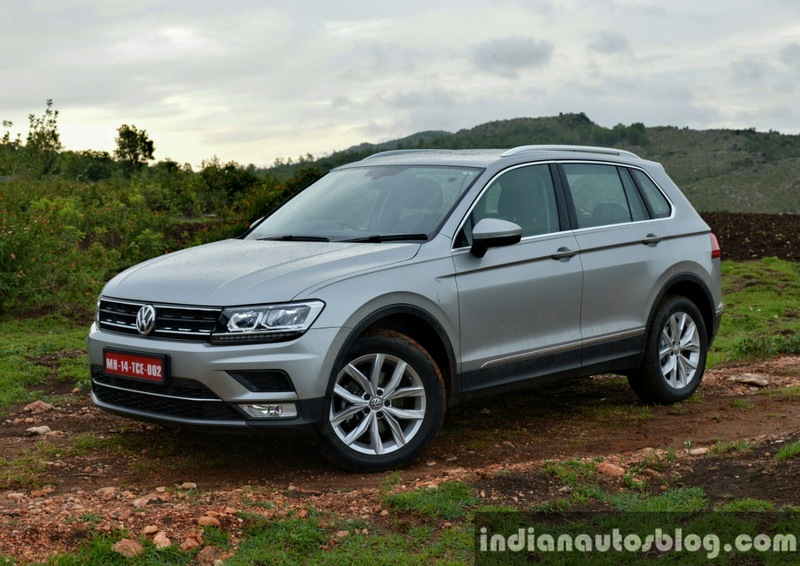 So is the Tiguan really worth recommending? Here's my first drive review of the 2017 VW Tiguan. The previous Tiguan had an inoffensive, neutral exterior design that didn't necessarily invoke a "wow" or an expression of admiration, and the same thing can be said about the new Tiguan as well. Granted, VW has added some tough character to the Tiguan increasing the dimensions and borrowing cues from the Touareg SUV, but when you look at the exterior of rivals like the Mercedes GLA, BMW X1, Audi Q3, Jeep Compass and the Hyundai Tucson, it doesn't really stand out. At best, the Tiguan's exterior is not going to get any looks of aversion; it's a safe, boxy design that will appeal to the niche customer. And then there's the part where you explain to your friends and family why it costs over INR 35 Lakhs (on road), when it doesn't look as expensive as the price tag. Nowadays, people associate INR 30+ Lakh SUVs with bulking, road hogging products like the Ford Endeavour and the Toyota Fortuner, or smaller, entry-level luxury crossovers with badge snobbery, which is not surprising given how car buyers in premium segments are image conscious and want bang for their buck. 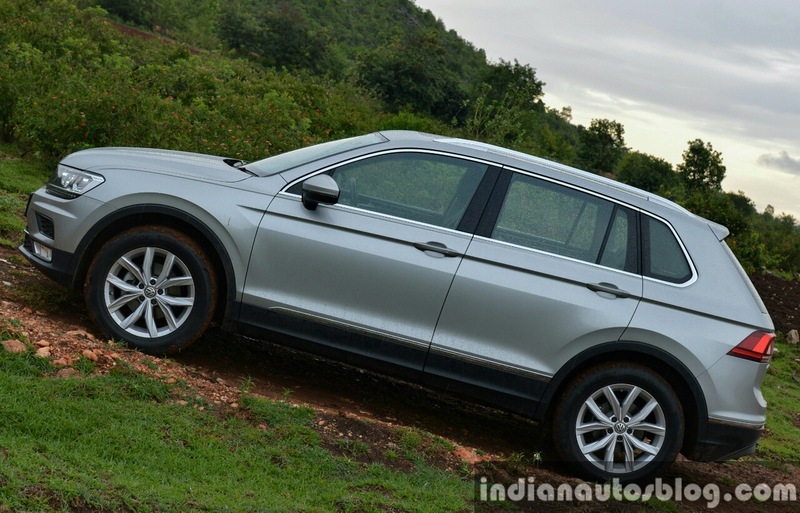 So they may tend to overlook the tempting list of exterior features in the top-end Tiguan Highline, such as a strong pair of LED headlamps with DRLs, LED taillamps, tastefully-sculpted 18 inch Kingston alloy rims shod with Hankook self-sealing tires, large and power-folding ORVMs, a panoramic sunroof, front and rear parking sensors with rear camera, tire pressure monitoring system and 4MOTION AWD system as standard. If the exterior still hasn't got you convinced, the interior might. Thanks to the exceptional build quality typical of a premium German car, usage of the right materials, contemporary design and good amount of tech, the Tiguan's cabin justifies its price tag. At night, the ambient lighting accents on the door cards, panoramic sunroof and LED cabin lights highlight the design and visually uplift the cabin experience. There are a few areas which use scratchy, hard plastic materials, but it's easily forgivable in this instance. 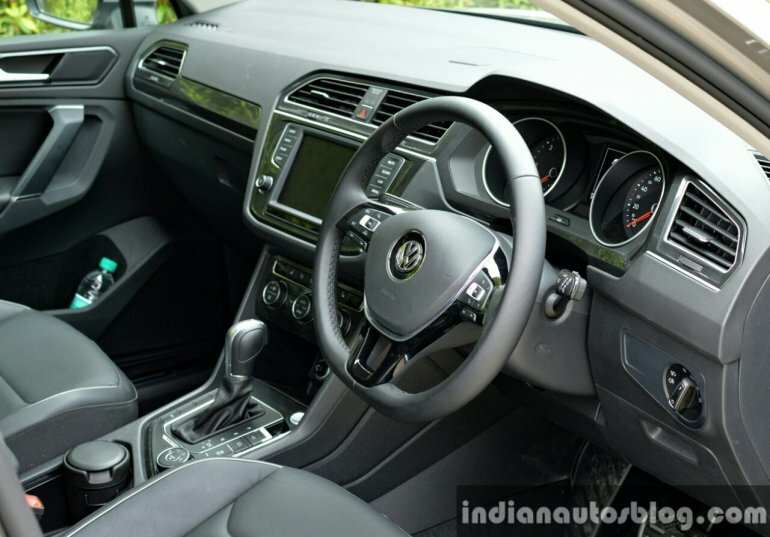 We only wish VW India would've offered the dual tone orange and black seats like in the model showcased at Auto Expo 2016, so as to add some character to the otherwise modest all-black interior. You can basically walk into the cabin, and plonk yourself on the firm, supportive driver's seat with power adjustments. 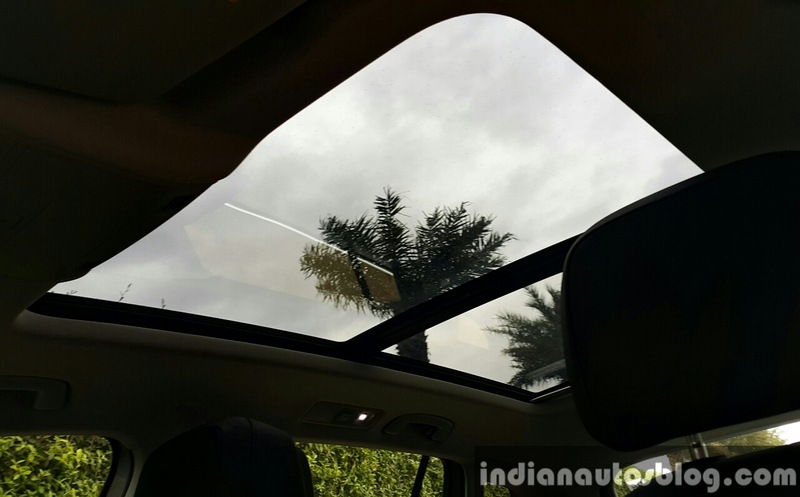 It has great all round visibility and, thanks to the panoramic sunroof, allows more sunshine to light up the all black cabin. With one of the front seats set for my 6'2 height, there was good amount of knee room to spare at the back, even with the airline-style foldable table folded down. Head room at the back is plentiful, while the middle seat is still comfortable with decent knee room despite the small floor hump. It also has a segment-first tri-zone climate control, so that rear occupants don't have to bother the driver or front passenger for their comfort. Storage in the Tiguan deserves top marks; there are cubby holes everywhere (even an hidden drawer under the front passenger seat). Should your wife happen to go a bit crazy shopping at the local mall, the Tiguan's 650L can easily consume all the bags with room still to spare. And if you're the one tasked to carry the bags and can't reach the keys, you simply need to wave your foot underneath to open the tailgate. The seats can also fold 40:20:40 to liberate enough space (1,655L) for a weekend camping trip. The Tiguan's practicality will strongly appeal to the family man in you. 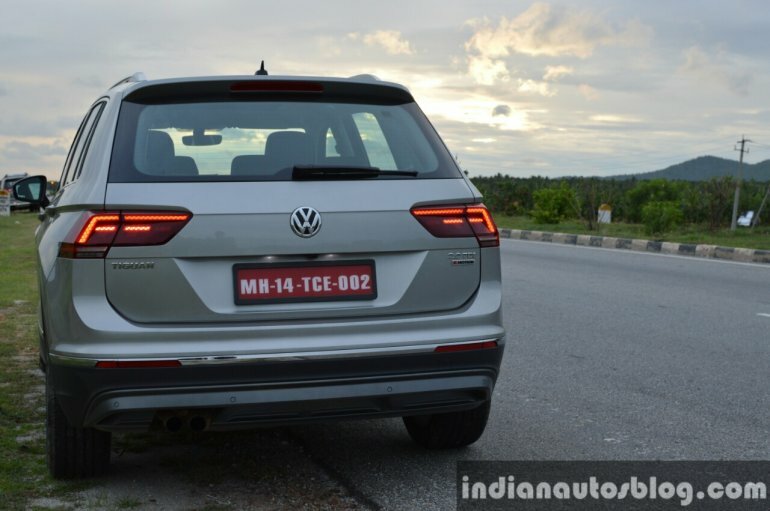 The Indian version misses out on VW's Active Info display option, but retains the fantastic 8 inch Composition Media touchscreen infotainment system with Apple CarPlay and Android Auto support, although it lacks an onboard sat-nav. The display is angled towards the driver, and its UI is quite simple to get acquainted with. Probably pointless in the Indian context are standard seat heaters, unless you are a geologist in Leh. As far as safety is concerned, the Tiguan has a solid five star rating from Euro NCAP, offering a plethora of active features as standard: six airbags, ABS, ASR (anti-slip regulation), pedestrian protection (lifts the engine hood by 3 inches), ISOFIX child seat anchor points, Hill Descent control, and Hankook self sealing tires (Highline only). For now, the VW Tiguan is only available with diesel power. 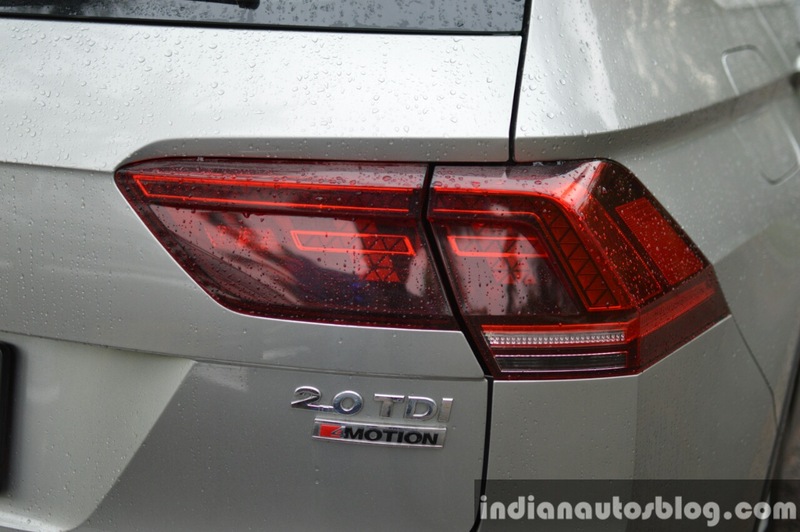 It packs the familiar 2.0 TDI 4-cylinder turbo diesel motor that outputs 143 PS at 4,000 rpm and 340 Nm between 1,750 - 2,750 rpm. Unlike other MQB-based products in India, the Tiguan gets the newer generation 7-speed DSG (DQ500) with steering-mounted paddle shifters as the only transmission option. It also gets an Haldex AWD system called '4MOTION'. If you're expecting the performance to blow your socks off, prepare for bad news. It's not that the Tiguan is underpowered, but you'll be left wanting a bit more from the TDI motor. This will only be a concern to folks who are heavy on the throttle pedal; calm and gentle drivers will more appreciate the TDI motor's exceptional refinement and linear power delivery than its average power output. The 7-speed DSG works like a charm, offering butter-smooth gear changes and lightning fast upshifts, although downshifts aren't quick when you request power from the motor. Switching to paddle-shifters and taking over gear shifting duties helps to extract the full potential. 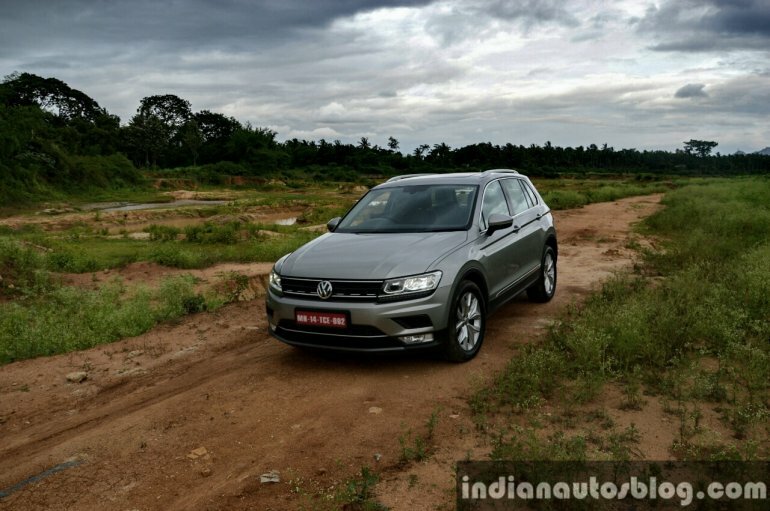 VW claims that the Tiguan can average a fuel mileage of 17.06 km/L (ARAI-certified). In our first drive, the Tiguan was averaging between 11.2 km/L - 12.1 km/L in varying conditions, which respectable figures for an AWD diesel-powered SUV. The Tiguan has a fairly absorbent ride quality that firms up as speed climbs for that rock-hard stability European cars are known for. The ride is so stable that one can cruise at speeds over 140 km/h on empty highway stretches without an ounce of timidness, although its boxy styling translates to perceptible wind noise above 120 km/h. In urban conditions, the McPherson strut (front axle) and independent Multi-link (rear axle) system can iron out road irregularities with relative ease. You can even enjoy a bit of light off-road activities in the Tiguan, thanks to the AWD system with Drive Mode Selector (Snow, Normal, Off Road and Off Road Individual). On our way to Chikmangalur, VW's folks encouraged us to head to an off-road location which had rain-soaked mud & ruts, steep climbs and small water bodies. Although the ground clearance in the brochure is given as 149 mm, it's the minimum figure (as per new ARAI rules) for the Tiguan; with just me behind the wheel and no luggage, the ground clearance was quite ample. It effortlessly traversed the off-road area, and came out dirty yet unscathed. Around corners, the Tiguan exhibits good composure. You can feel body roll, but it's well suppressed for an SUV that eats potholes. Thanks to the chunky 235/55 R18 tires and AWD system, there's plenty of grip from the get-go. The electric steering system is accurate to turn in, and can be tweaked for feel using the Drive Mode selector. 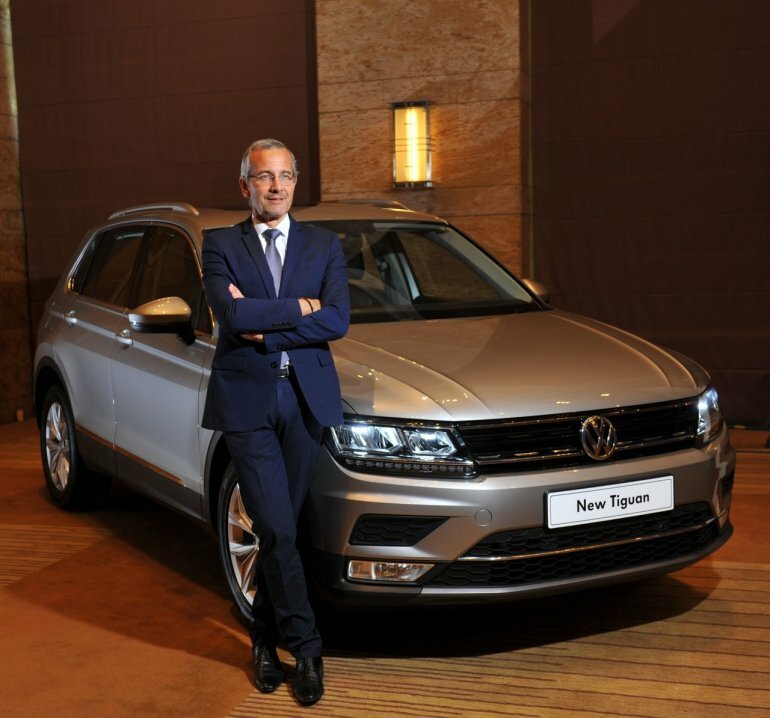 VW India launched the Tiguan in India on May 25, 2017. At launch, it was priced at INR 27.98 lakhs for the Comfortline trim and INR 31.38 lakhs for the Highline variant (both prices ex-showroom, Delhi). The Tiguan comes with a standard warranty of 2 year/unlimited kilometres, which can be extended for a further 1 year/80,000 km or 2 years/100,000 km. 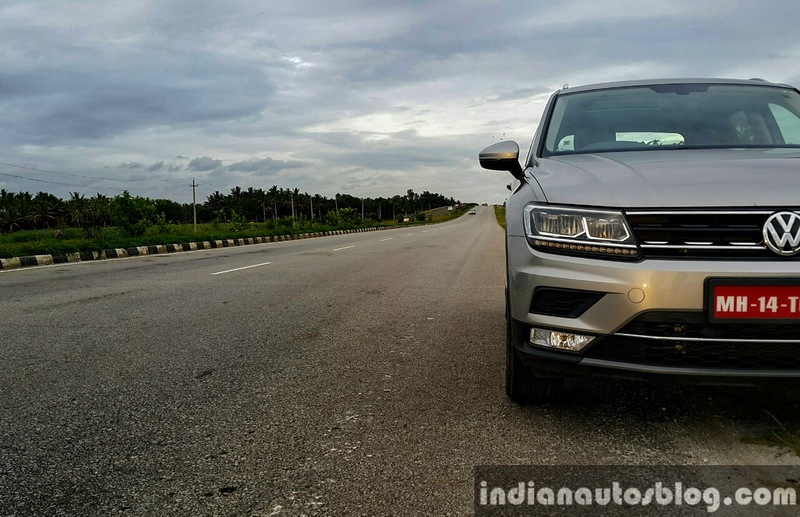 A compact Volkswagen SUV that starts from INR 27.98 Lakhs? I'm sure when the sales staff at VW dealerships heard about the pricing, they would've worried about pitching it to a customer who would generally expect a lot - particularly from the visual standpoint - from an SUV at that price point. But VW is encouraging prospective customers to test drive the Tiguan before they make any judgements, as they believe that the package is compelling enough to sell itself. And, to a good extent, it is. The superb list of features, excellent interior build quality and space, refined powertrain and comfortable ride quality will strongly appeal to the folks who aren't image conscious or badge snobs. From my perspective, the Tiguan is immensely attractive because it's as advanced and well appointed as luxury crossovers costing north of INR 40 Lakhs, lacks the bulk of a Ford Endeavour or Toyota Fortuner, so that urban drivability is as easy as a hatchback, and has decent fuel economy numbers. If this is exactly what you're looking for in a premium SUV, we would recommend checking out the VW Tiguan.